Zama introduces the only Halo Massage in Portland, Oregon. Perfect way to get a salt treatment and massage in at the same time! Live and breath easier with halotherapy. Although halotherapy is cutting edge and is currently used throughout Asia and Europe, salt therapy dates all the way back to ancient Egypt. Salt has anti-bacterial, anti-viral, anti-fungal, and anti-inflammatory properties that provide healing benefits to the whole body- specifically the skin and respiratory system. It also stimulates healthy immune function and provides relief from stress, anxiety, and depression. Salt therapy can help you breathe easier and live better- from the inside out. Halotherapy is beneficial respiratory and skin concerns. Halotherapy is beneficial to those that suffer from asthma, allergies, and bronchitis, as well as skin conditions like psroiasis, eczema, and acne. Clinical studies have shown that patients have been able to reduce their use of medications, hospital visits, and frequency of asthma and allergy attacks through the use of salt therapy. It is also recommended for healthy people, as it boosts the immune system and helps to combat the pollutants, dust, and bacteria in our environment. Be healthy like a salt miner! In 1843, a Polish physician first wrote about the benefit of salt mines. He noted that salt miners had significantly lower rates of lung disease compared to the general population. He attributed the cause of the salt miners’ good health to the salt cave air, which was saturated with saline dust. Halo massage is provided in one of our beautiful salt rooms. Choose from Swedish, deep tissue, sports, craniosacral, or Reiki. While you are enjoying your massage, a salt generator (halogenerator) silently emits vaporized salt into the room as you relax and breathe deeply. 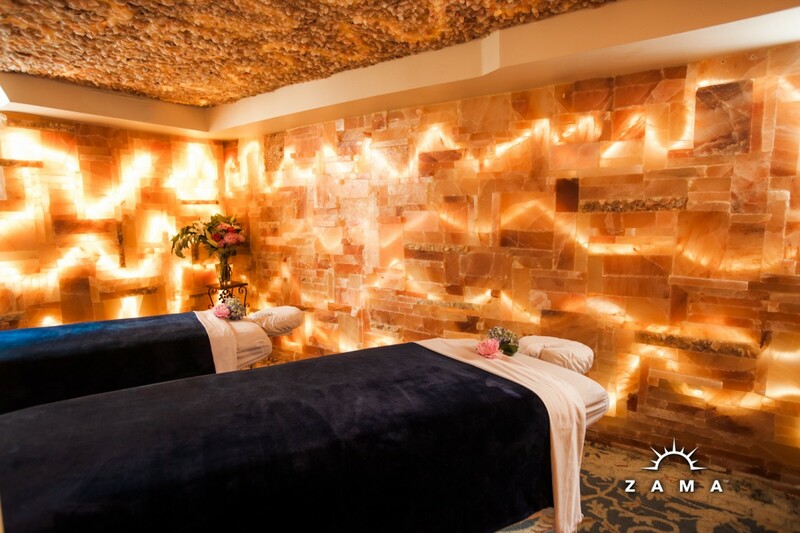 The walls and ceiling are lined with Himalayan salt bricks and panels backlit by hundreds of ambient LED lights. Decrease stress and increase immunity. The therapeutic inhalation of salt is made possible with the use of our state of the art halo-generator, which produces micro-sized salt particles. As you inhale the salt into your lungs, it decreases inflammation of the bronchial passages and helps to fight infection. Our halotherapy rooms also creates a negative ion environment that decreases stress, promotes relaxation, and increases an overall sense of well-being.